John Oakham Throwing out a Signal for an Engagement, Sayer and Bennett, 1781, collection unknown. 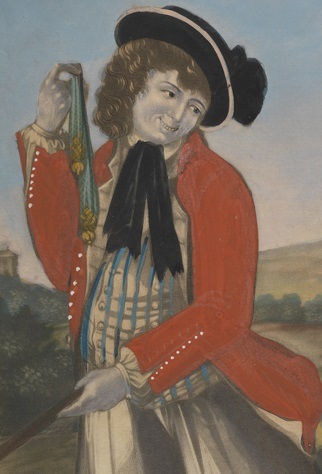 John Oakham Throwing out a Signal for an Engagement, Sayer and Bennett, 1781, National Maritime Museum. 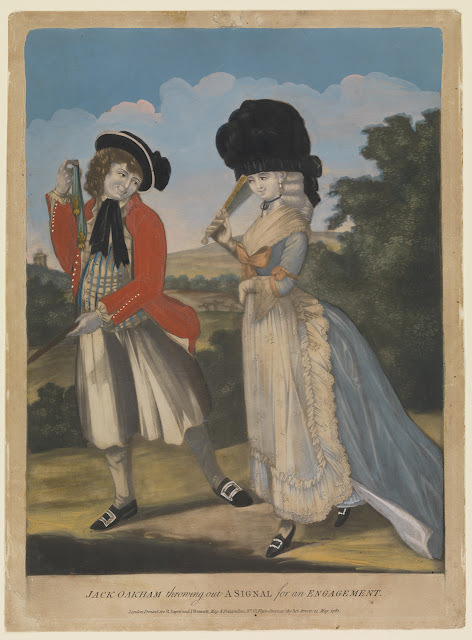 Lest we think that Carington Bowles was the only man to produce colorful images of sailors courting women under the cover of naval terms, here's a wonderful piece from Sayer and Bennett released in 1781. 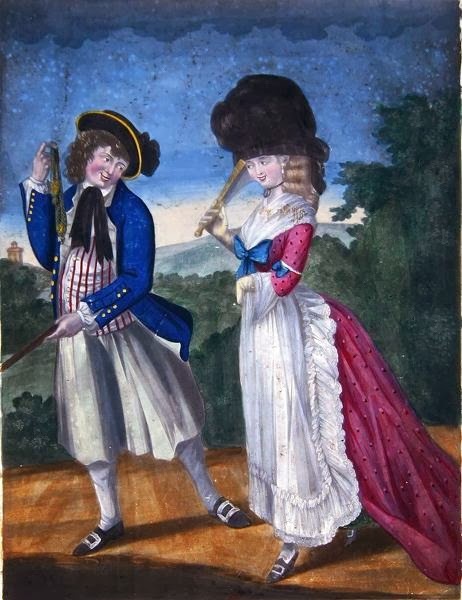 Not unlike many other images, the comely lady is enthralled by the sailor and (more specifically) the purse he dangles in his right hand. The "signal" is something largely unfamiliar to modern audiences: a "miser's purse." The miser's purse happens to look like a certain aspect of the male anatomy, a fact that is probably not lost on the artist or viewer. She returns his signal with a touch of her fan. John Oakham wears a black round hat with gold tape and a large black bow on the left side. His hair is shoulder length and loose. A white collar is folded over a black neckcloth that hangs from its knot over a striped red waistcoat with cloth covered buttons. John's double breasted jacket is blue and lined in white, with slash cuffs and brass buttons. White slops, white stockings, and black pointed toe shoes with large rectangular buckles finish his slop clothes. Tucked under his left arm is a walking stick that he carries in a very handsome fashion. 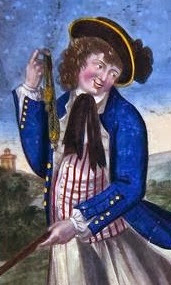 In the National Maritime Museum version, the color of his jacket and waistcoat stripes are reversed, while his jacket buttons are white metal.